In the 1966 film Fantastic Voyage, a full-size underwater vehicle was shrunk to microscopic size and injected into the blood vessels of a person. Now, a team headed by Dr. Moshe Shoham of Haifa's Technion has created a novel propulsion system for a miniature robot to travel through the spinal canal, powering through cerebrospinal fluid. Dr. Shoham is also the primary developer of the SpineAssist robot to aid surgeons in performing delicate spinal procedures (see SpineAssist Robot Has Got Your Back). The requirements for a robot that moves through body cavities are strict; it must be small enough to move through the body and it must have a propulsion system that is flexible enough to work. Devices like the PillCam, a pill-shaped camera that is swallowed to picture the complete digestive tract, are moved along by the body's own peristalsis, and do not need their own propulsion system. "The first location we're targeting is the spinal canal - which means the device will travel through the cerebral spinal fluid (CSS) which is clear and similar to water. It doesn't flow too fast, but it needs propulsion," said Dr. Shoham. "Now we have the propulsion system, but we still don't have the actual payload - whether it's a camera from images, or a subsystem which would take a biopsy - that's still in the development stage." 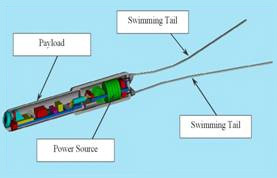 The robot would in essence be a free-swimming endoscope; a robot with two actuators - swimming tails - that will have a camera in the head to broadcast images to the physician outside. "I believe that in the future there will be micro-robots that will be permanently implanted in our bodies and will be able to navigate to problematic points. This is a step up for micro-penetration into the human body." DARPA has awarded a $12 million contract to develop an automated medical treatment system that can recieve, assess and stabilize wounded soldiers immediately following injury. Read an interview and press release; found this one on medGadget.